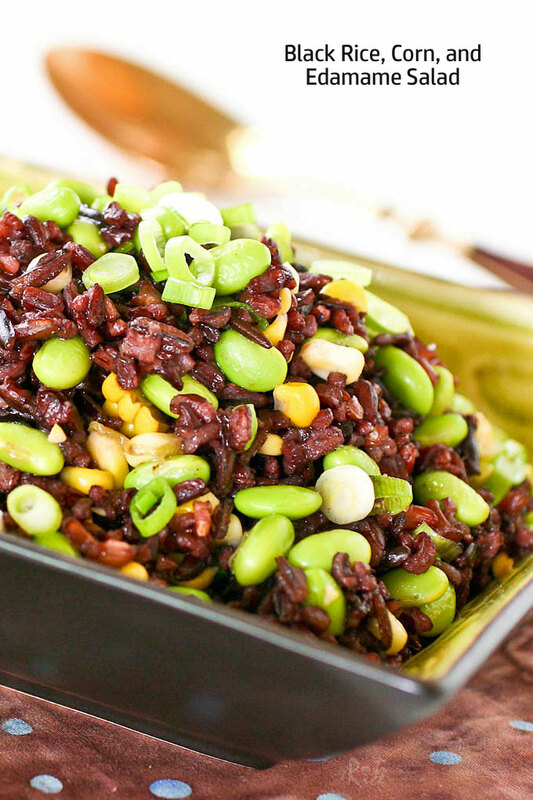 This fresh and tasty Black Rice, Corn, and Edamame Salad is flavored with a rice vinegar, honey, and sesame oil dressing. Wonderful served with seafood. There are numerous types of rice being cultivated all over the world from short grain to long grain and plain to aromatic varieties. Some are pretty exotic like Wehani, red, mahogany, and black rice. These tend to be chewier and nuttier and are perfect for salads. 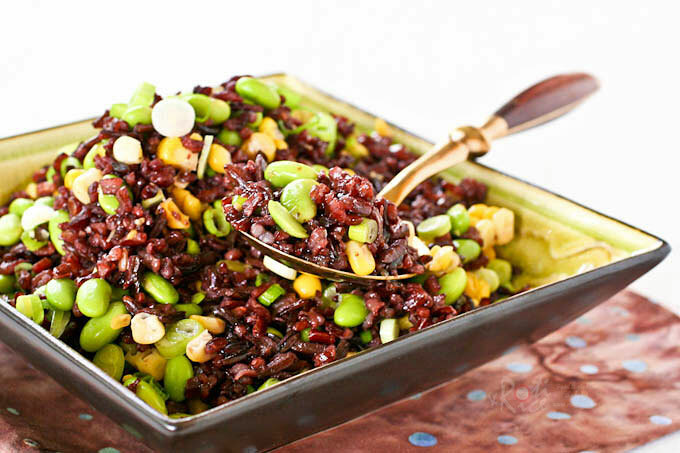 Today’s Black Rice, Corn, and Edamame Salad uses a mix of black, mahogany, and wild rice. I usually keep a variety of rice in my pantry for different purposes. For most days, I cook a mix of medium grain white and brown rice. Whenever I make curries, I use basmati rice. For sushi and rice cakes, I use plump and starchy short grain rice. I even tried a bamboo infused rice in this Chirashi recipe which has a lovely pale green color. For a contrast of colors, I added boiled and shelled edamame (green soybeans) and fresh seasonal corn. The dressing is just a simple combination of rice vinegar, honey, and sesame oil. The salad was light, fresh, nutty, and tasty. It can be served as a side dish or a stand-alone vegan lunch. 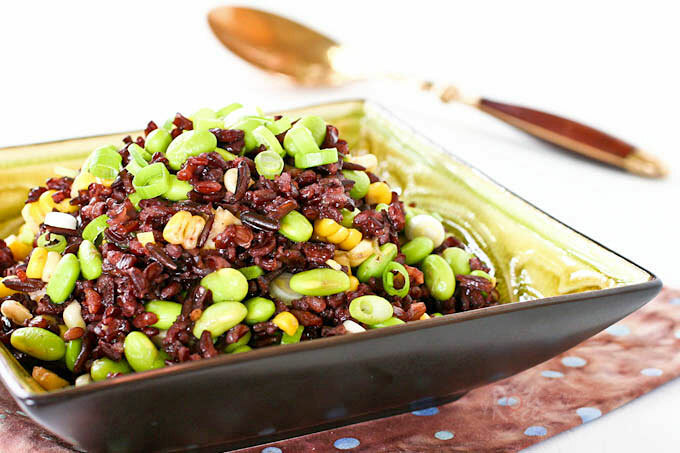 Combine the Black Japonica and wild rice together. Wash and drain thoroughly. Place in a medium sized pot together with 2 1/3 cups (560 ml) of water and sesame oil. Bring to a boil. Reduce heat and allow it to simmer for 40 to 45 minutes or until all water is absorbed and rice is tender. Place in a large bowl together with corn. Boil edamame in lightly salted water for about 3 minutes. Drain and add to large bowl with wild rice and corn. Combine all dressing ingredients in a small bowl. Pour over wild rice, corn, and edamame. Toss to combine. Sprinkle green onions on the top. We had a mini celebration recently and I made a surf and turf for the family. 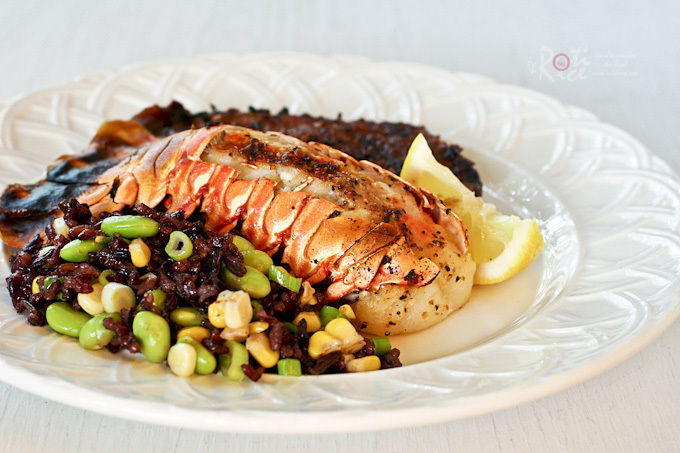 This light and tasty Black Rice, Corn, and Edamame Salad was a side dish for the Broiled Lobster Tails and Grilled Ribeye Steak. Recipe for the Broiled Lobster Tails will be coming up next. Just dish me up that last plate will you? 🙂 I was already drooling over the salad then you threw the lobster on top. You’re mean. 🙂 Delicious salad!